New Restaurant To Open… A Long Island restaurant group is set to open its newest eatery at the site of the former TGI Friday’s in Huntington Station. The Bryant (100 Walt Whitman Rd., Huntington Station) is set to open in early December and is owned by Roslyn-based Poll Restaurants. The restaurant group was founded by brothers George and Gillis Poll and currently operates six other restaurants in Nassau. The Bryant is a tip of the cap to the Poll’s flagship steakhouse Bryant & Cooper in Roslyn. The restaurant is set to feature an American bistro style menu and will offer lunch, dinner and brunch options. In addition to the large indoor dining area, The Bryant will also have space for outdoor dining. Stay tuned for our Foodies’ take on the food and décor once The Bryant opens next month. 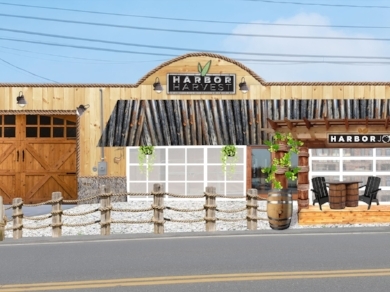 Connecticut-based Harbor Harvest is planning to open its second retail location at the edge of Huntington Harbor of 135 New York Avenue in Halesite. A Fresh Harvest On The Harbor… The shores of Huntington Harbor in Halesite could soon be the newest place to buy locally sourced food. Harbor Harvest plans to open its second retail location at 135 New York Avenue in Halesite. Harbor Harvest’s mission is “to provide convenient access to healthy, nutritious food sourced from local and regional farms and artisans at a price that supports the local community,” according to the company website. The company currently operates a store in Norwalk, Connecticut and is looking to expand into the Halesite location by spring or summer of 2019. The store in Norwalk includes a café, bakery, butcher, deli and products from local vendors, and the company plans to model the new location in the same way. Harbor Harvest owner Robert Kunkel, of Norwalk, travels to farms on Long Island and Connecticut to find local produce and meats. Harbor Harvest features a menu of sandwiches and daily specials, as well as a unique brand of coffee called Harbor Joe. For more information on Harbor Harvest visit Harborharvest.com. Winter Farmer’s Market… Those fresh produce lovers who are sad to see the end of the farmer’s market in Huntington village have a new market to look forward to. The Huntington Winter Farmer’s Market is set to kick off on Sunday, Dec. 9 with a new location at Jefferson Primary School at 253 Oakwood Road in Huntington. The market is indoors so weather won’t stop vendors from showing off their local, fresh creations of cheese, bread, pickles and more. The market is scheduled to take place every Sunday from Dec. 9 until March 31 from 9 a.m.- 1 p.m.